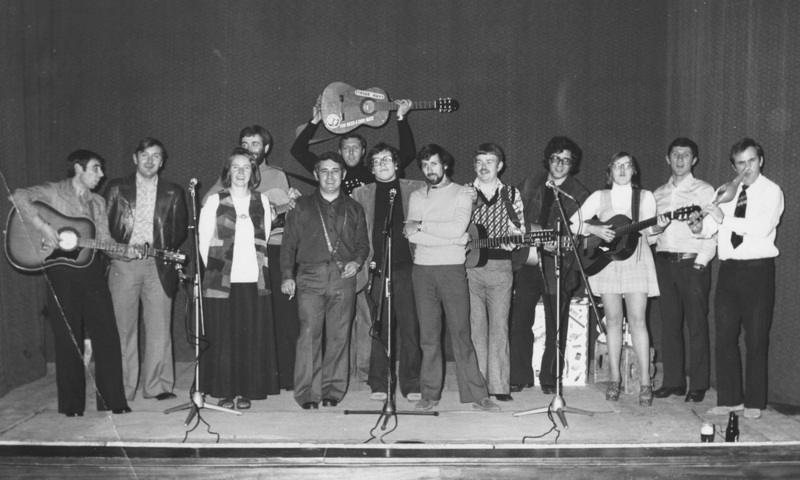 Profiles of the unsung heroes of the UK folk scene from the first revival of the late 1950s through to the 1970s. “Is this a supergroup?” asked a friend of mine as we took our places last night in the third row of this tiny, historic, yet barely half-full Hastings cinema. 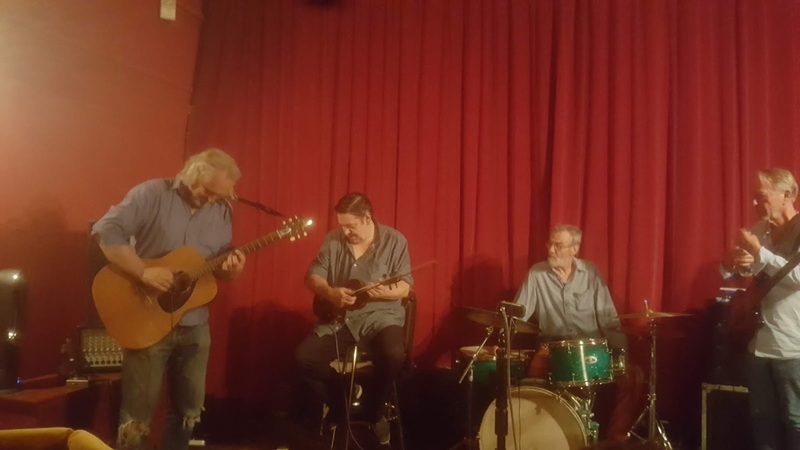 If about 250 years of combined experience playing with some of the most important western musicians of the 20th Century fits the bill, then The Prisonaires are definitely a supergroup. While not household names, any blues, jazz-rock, folk, or rock enthusiast will understand that these gentlemen were pivotal to some of the most ground-breaking music of the 1960s and '70s. Yet there were plenty of empty seats in a venue that only has 48 of them. Acoustic guitarist and leader of the band, Alan King commented wryly that scheduling a gig during an international football tournament is always a disaster. But can it be that south-coast music buffs preferred staying at home to watch telly in the hope that Argentina would defeat the French, than attending a gig of this quality? When The Prisonaires finished their set a member of the audience stood up and shouted that it was the finest gig he’d seen in Hastings in years. It was one of the finest gigs I’ve seen anywhere in years. Musical impresario, Alan King was a doyen of the famed 12 Bar Club, the ‘60s Soho music venue that gives the name to Dr King’s ‘12 Bar Music’, the platform for this and for some forthcoming Electric Palace gigs. 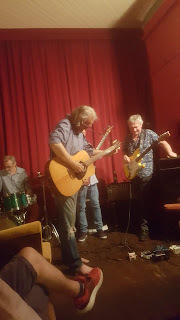 King told me outside the Gents – the Electric Palace is so small that the toilets are never far away – that he is lucky enough to have played with his favourite guitarists, Davy Graham and Bert Jansch, and his favourite singer, Miller Anderson. For many years King also played with his favourite songwriter, Alan Hull (of Lindisfarne). The aura of Graham and Jansch hung over proceedings as King opened the set riffing on the rite of passage folk guitar tune, ‘Anji’. What the advance publicity promised would be a hybrid of The Pentangle and Can, “with a touch of Miles Davis’” jazz-rock-funk fusion, was underway. ‘Anji’ went from sounding like The Pentangle were performing it, to something with a lot more attitude. Almost like Fairport Convention’s ‘A Sailor’s Life’, but lifted beyond even that wonderfully free-flowing, folk-jazz hybrid However I couldn’t detect the influence of Can on this or on any of the other tunes The Prisonaires performed last night. It was undoubtedly an eclectic set though, and The Prisonaires have certainly embraced Can’s determination to kick against the musical pricks. What happened on ‘Anji’, and throughout the gig, was a superannuated jam session without the tedium that that would normally imply. Each number, often only loosely based on professed connections to an original tune, has a distinct concept behind it that’s usually conceived of and initially worked up by Alan King. It might be a radical reworking of a known tune or the fusing of diverse tunes and elements together – the second number was inspired by ‘Sketches of Spain’ era Miles but went all over the place. King communicates with some band members via SoundCloud (“or just by text”, grinned guitarist Paul Baverstock). Rehearsals are live. Some band members, like the audience, may be hearing a number for the first time. To carry this off you need musicians of a very high calibre and, as importantly, imagination. 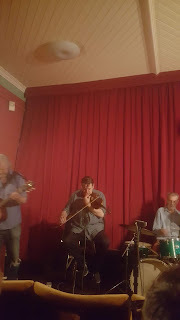 Alongside King in this endeavour last night were virtuoso fiddle player Bobby Valentino, who at 64 is one of the youngest in the band. Valentino was in The Fabulous Poodles, worked extensively with The Men They Couldn’t Hang, and has played with Dylan, Knopfler and Petty. He is part Stephane Grappelli, part Jean-Luc Ponty, but is mostly just himself. On electric lead guitar was Paul Baverstock. Paul, who also spoke to me outside the Gents, said that he was in the celebrated London band that nearly made it big in the early ‘80s, A Bigger Splash. Their first single, ‘I Don’t Believe A Word’, was produced by Sting who also, with Eddie Reader, sung harmonies on it. It made it to the influential BBC Radio 1 review programme, ‘Roundtable’, but had the misfortune of being followed by Prince’s ‘Kiss’ which, Alan said, blew everything else out of the water that week (or pretty much that decade). Last night Paul’s impressive pedal effects assisted him in alternating between a blues-inflected rock guitar sound that often echoed Dave Gilmour, and being a Hammond organ virtuoso. Paul was loud for a small venue but was darned good. To his right in the all-star line-up was Tony Reeves. Tony has a strong jazz feel to his impressive electric bass playing; hardly surprising given that he was founder member of fusion band Colosseum and later joined Curved Air. Like Alan, Tony started out on the folk circuit. He’s on Davy Graham’s first two albums. A few years later he joined John Mayall’s celebrated Bluesbreakers, along with Mick Taylor who a few months later replaced Brian Jones in the Rolling Stones. Reeves has also played with, and produced, John Martyn and is the bassist on a Sandy Denny LP. By contrast, as a Pye Records’ plugger in the mid-60s, Tony promoted, and then played on, Tony Hatch’s ‘Sounds Orchestral’. In the centre of the stage, and often, my friend observed, making sure that the whole thing held together, was drummer Les Morgan (who’s performed with leading UK blues artists Alexis Korner and Jo-Anne Kelly, and with singer Chris Farlow). Les isn’t musically ostentatious like Paul, but, as good drummers often do, provides backbone (and flair) when some of the showmen occasionally threatened to take proceedings off on too conflicting a set of tangents. Alan King told me that the band also normally features Mike Paice (a Jools Holland sparring partner) on sax and harmonica, who, to King’s surprise given the unusual combination of instruments, gels successfully with violinist Valentino. Among the most interesting musical adventures of the night was a number influenced by Miles Davis’ darker funk-fusion phase that also informed its title, ‘It’s About That Voodoo Time’; and a latin jazz excursion based on a number by jazz guitarist Kenny Burrell. In something of a preview of his own forthcoming set at The Electric Palace on 21 September, King took the band on a further musical diversion: ragas. He found suitable accompaniment from Valentino, before Reeves and Baverstock somehow worked out their place in the evolving mix. The Prisonaires' ‘raga rock’ is wholly its own thing, and has been a decade-long musical preoccupation for King. No easy nod here to George Harrison, The Byrds or even L. Shankar. The September gig by Dr King, possibly accompanied by some other members of The Prisonaires, will be well worth seeing. The closing number was introduced by Alan as a fusion of two pivotal Jimmy Webb songs: - “the greatest anti-war song ever written”, ‘Galveston’, and the “greatest love song ever written”, ‘By The Time I Get to Phoenix’ – but without the words! This was an extraordinary musical idea successfully realised: you could hear the trace elements of both Webb classics in the heady mix. 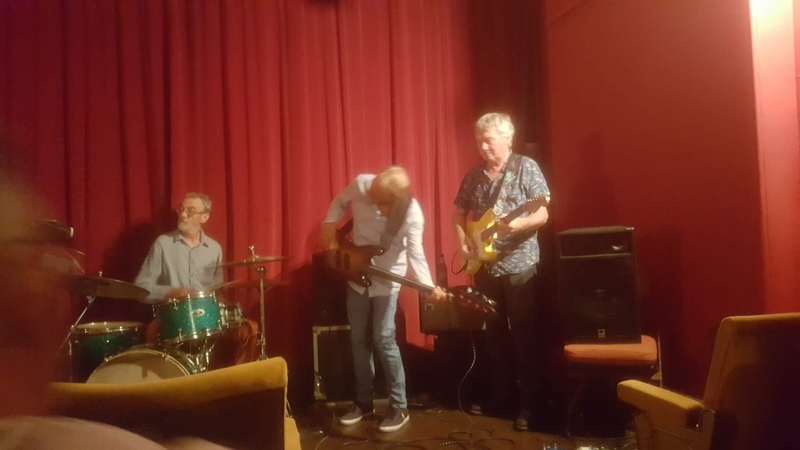 On a sweaty night out in Hastings some thirty odd people had experienced a real treat, and they rightly gave the band a rapturous response. Cries for an encore were understandably resisted though as the band, tired and thirsty, had done what they set out to do – whether Can were in the house or not. Being a local music lover I have missed a good gig here. They will need to be better advertised for there return Gig. Dear HFG chair, It will be Dr King and possibly a couple of fellow band members on 21 Sept apparently. Thanks for the response. A lot of names blowing the cobwebs from my brain. Sounds like a great gig. Pity the soccer and the hot weather got in the way of a bigger crowd. Good review Neil. I feel I've really missed something exceptional here! Did anyone video it? As ever a very well written and knowledgeable review. And as ever a great turn of phrase - "... a superannuated jam session without the tedium that that would normally imply..." brought a smile to my face! Brilliant review. It's just like being there. And I was. Really one of the most remarkable and memorable live performances I've seen in Hastings. Great venue too. Thanks for all the comments, really good and really appreciated. There's nothing worse than the usual experience of communicating to the void. Never as satisfying as doing deep knee bends in the void..
or a "Genuflection at the Temple of Squack"
Thanks for your comment 'Unknown'. If you fancy identifying yourself (to me at least, via neilpartrick@hotmail.com - careful with the spelling) I am happy to pass on your best wishes to Paul Baverstock and/or Alan King. Paul is highly unlikely to see your comment here. Best wishes Neil. Contact "Searching for the Old Folk Rebels"
If you have any ideas, thoughts, or perhaps some interesting and relevant photos that you could send me electronically, then please get in touch. or via the "SearchingforOldFolkRebels" Facebook page. Neil Partrick. Awesome Inc. theme. Powered by Blogger.